That's not enough ram, get 4 GB min. Large maps will crash, it's almost inevitable especially with XP's less than stellar memory manager. System ram is only part of the issue, the 512MB on the gfx card is snt helping either. I strongly suggest upgrading to a card with 1GB or more. @Prj, what part of the world are you located in? were would you go to buy a new or s/h gfx card..? Also whats the makre/model of your motherboard and Powersupply..? True but at least with GFX memory he can use the rounddown commands to fit the textures into GFX memory, but you can't make maps any smaller. In fact, @Prj, can you start a new thread in the tech support section, ta. to the next so it's a last resort option. I have 512 mb graphics ram, too, and it never caused any troubles on my side. I notice that XP is more susceptible to this, are you on XP Obs? Oldjim - thanks for the hint - I've walked through the chapel a few times but never looked too closely. Moonbo - got some house renovations on the go so I'm limited to how much I can play at the moment but I hope to get lost for a few hours later today. Well, I gotta admit, this North Wing mystery has me stymied. I've read the book on the pulpit so I get that there's a place under the chapel I need to get to but I have no idea how to do it. I still can't open the door on the upper chapel balcony. The book sitting on the pew is not frobbable. I've found the small passageway by the pews but there's nothing in there to do except join back up to another part of the mansion. I've checked and re-checked the North Wing attic but I can't see anything in here except for some urns, one of which has blood on the floor, which is probably a hint regarding the bad man's heart. I think I'm gonna need a major hint here, guys - I've been pullin my hair out and I don't have that much left to play with, heh. No need to go anywhere outside of the North Wing. You just need to go to this room, you should be able to unlock it with the North Wing Room Key and find a spirit gate inside to take you back to the spirit realm. Where you can grab the bad man's heart up in the attic. Let me know if that doesn't help :-). Edited by esme, 02 June 2015 - 05:28 AM. the gold statuette on the table by the fire is not frobbable for me - even with my amulet selected in my inventory, the statuette won't light up? Oh man...you might have a corrupted save. I can't see how that would make something unfrobbable but the only solution might be to restart :/. Do you have a save file you can upload. Maybe SteveL can look at it so it can be fixed in the future. can't upload a save to here because of the size restriction (my save is almost 5mb) but it's no biggie - this is such fun to play that I'll do a restart and make the north wing my first mystery to solve instead of my 3rd, lol. I'll let you know if that problem occurs again. I tried to place the statuettes on the floor next to the holy symbol at first. When nothing happened, it didn't occur to me to try and stuff them inside the tomb itself. Just thought I'd give a quick update. I have access to a much higher-end system (8 GB RAM, 2 GB RAM on the graphics card, slightly faster processor). So, I installed Dark Mod on that system and played this mission and had no trouble making it to the second part of the mission. I am based in the US and would either buy online or go to Best Buy if I decide to get more RAM for my lower-end system. But, there's no hurry on that. Just wanted to give the update. After I've gotten into the locked room on the second floor of the North Wing, gone to the spirit world, and come back out again, when I try the golden statuette in the North Wing sitting room, the statuette no longer lights up or lets me enter the spirit world from that location. Is that normal? Or is something wrong and I have to use noclip to move through the walls to get back to the rest of the North Wing? I've found a note from G. about adding something to Sir James's drink, but the pouch can't be picked up. I've been to every room in the North Wing, collected every piece of loot, and every diary and letter, and I still have no idea what to do next. The sitting room statue should be unfrobbable after meeting the bad man. In James room should be another gold statue you can use to get back into the spiritual world. One player had a corrupted save that made this statue unfrobbable, if that's the case you may need to replay the level. But if so can you load up a save file so we can see what's going on. That's helpful, Moonbo. Thank you. The sitting room statuette is no longer frobbable. Check! That's what happened to me. I thought that was weird since i can't exit from Sir James's room in the spirit world. Both doors are locked, the secret room has no exit at all, and I only have a single lockpick in the spirit world. That's why I'm kinda stumped and have no idea how to proceed. Ah so you got to the spirit world from james room? 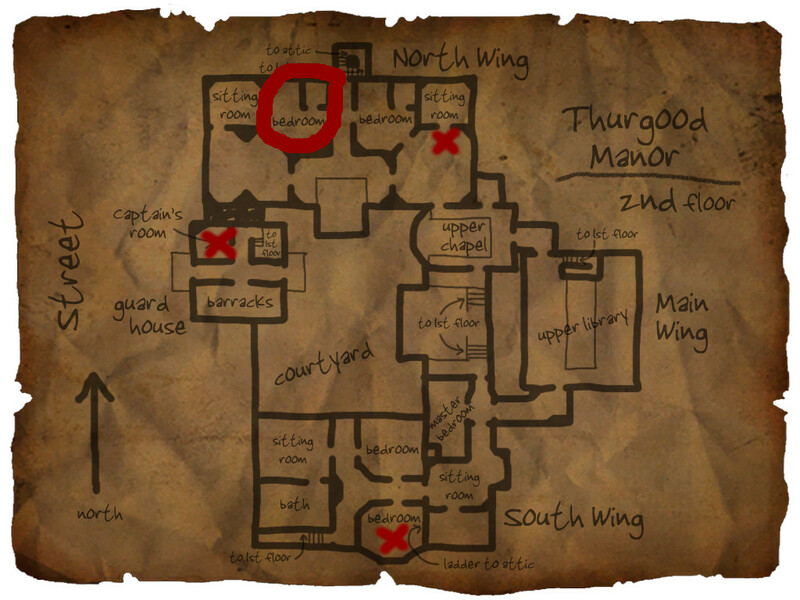 The second lockpick should be on the letter in that room. This thing is just epic. Hard to find words for it. Where is the key to the lower warehouse? 2: Which portal allows access there? Edited by hanmin, 03 June 2015 - 10:58 AM.